Lewis ****: "A+ service and product very happy with exhaust cheers." Yuma ****: "Fast delivery and I live rural, amazing pipe sounds awesome, didn't even realise my bike could growl like it does now with this can awesome!!" Rachael ****: "Thanks heaps, sounds awesome great purchase." Pete ****: "Good deal thanks." My Monster 400ie already had the OEM mufflers shortered and cored and it was already sounding like its much bigger brothers, but after fitting a pair, (I know, overkill) these Spark's have made an incredible differences to the music of the Duc. For me, it is better with the Db killers IN. It is still real deep and throaty and loud enough without being offensive. GREAT investment, real easy fitting setup. Guaranteed to put a big smile on the dial. 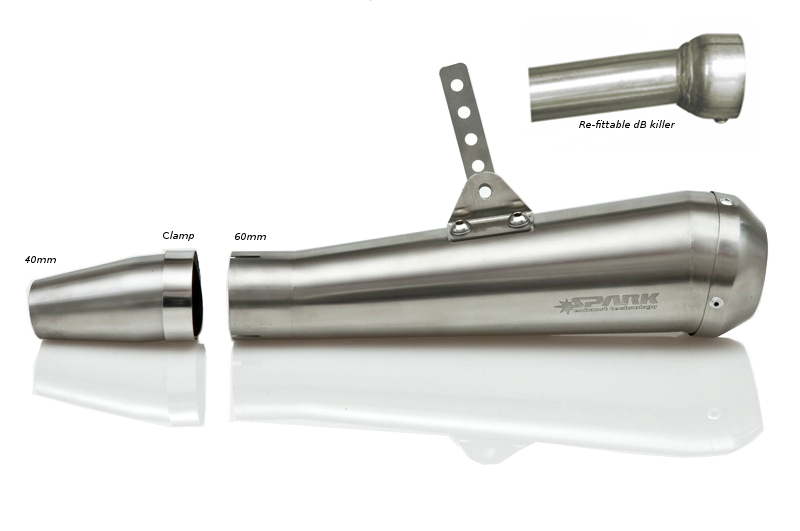 [Note this is a FastBikeGear staff review] We have installed one of these onto a 2 into 1 exhaust system we made for the FastBikeGear project Ducati. We tried a variety of different mufflers on this bike before settling on this one. The sound is absolutely delicious. With the dB killer removed the silencer gets louder (not by as much as we expected) and takes on a much deeper tone and suprisingly is very easy to live with on longer trips. The plan was to ride it on the road with the dB killer in place and only take out the dB killer on the track, but surprisingly it's still not to loud with dB killer removed... and once you have heard it with the dB killer removed you realise it would be socially irresponsible to put the dB killer back in and deprive anyone of the sound. Performance? The job of a silencer is to do exactly that, reduce the sound. 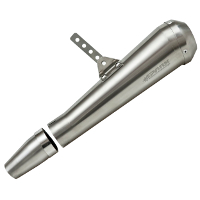 A silencer can not add performance to a 4 stroke motorcycle bike it can only stifle the sound and performance it, if they were allowed to run straight pipes without silences in MotoGP, the teams would do it to not lose performance. These silencers have a straight through baffle design and are consequently very free flowing....but oh the sound! Definitely one of the best sounding silencers we have ever heard on a V-Twin. Any of our Auckland based customers is welcome to come and have a listen to this. My Monster 400ie already had the OEM mufflers shortered and cored and it was already sounding like its much bigger brothers, but after fitting a pair, (I know, overkill) these Spark's have made an incredible differences to the music of the Duc. For me, it is better with the Db killers IN. It is still real deep and throaty and loud enough without being offensive. GREAT investment, real easy fitting setup. Guaranteed to put a big smile on the dial. ..
[FastBikeGear comment: Because we don't have the header pipes that Bruce purchased listed as a product on our web page this seemed the next best product to assign to his feed back to. Thanks for the great pics of your new Spark headers on your Monster. They certainly clean up the lines of the bike and have got rid of that ugly udder like catalyst hanging under the bac of your bike. I have posted the pics to our customer bike gallery in facebook.] ..
Pete ****: "Good deal thanks." ..